Sara Sinclair is an oral historian of Cree-Ojibwa, German-Jewish and British descent. A graduate of Columbia University’s Oral History Master of Arts program, Sara was the project manager and lead interviewer for Columbia Centre for Oral History Research’s Robert Rauschenberg Oral History Project. With Peter Bearman and Mary Marshall Clark, Sinclair edited a book from these narratives, which will be published by Columbia University Press in spring 2019.Prior to attending OHMA, Sara lived in Addis Ababa, Ethiopia, where she conducted an oral history project for the International Labour Organization’s Regional Office for Africa. Sara’s work as an oral history consultant includes work for the New York City Department of Environmental Protection and the Exit Art Closure Study, a research project on the closure of New York gallery/artist’s space Exit Art (1982-2012). 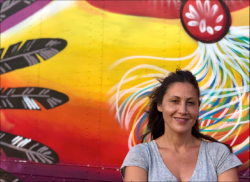 For Sara’s thesis at Columbia she conducted a series of interviews exploring the narratives of university-educated, reservation-raised Native North Americans on returning to their Nations after school. Sara expanded this project, How We Go Home, through Voice of Witness’ Story Lab and is currently editing a forthcoming book with the organization.